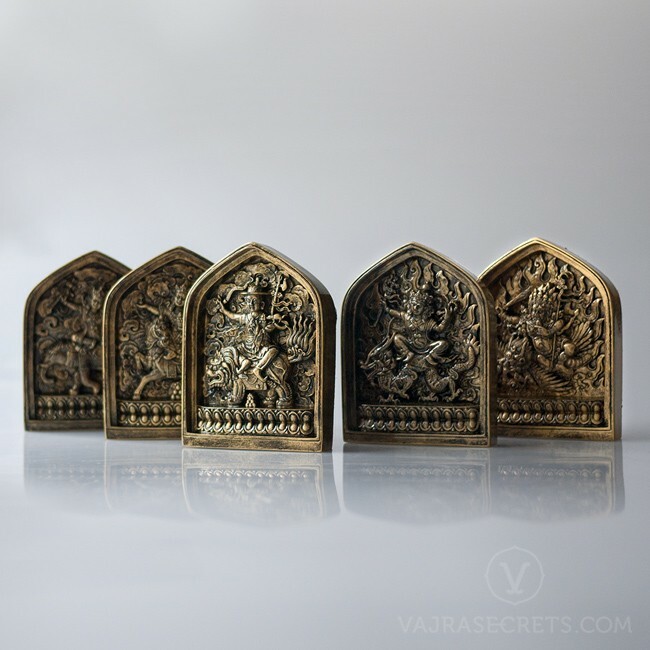 Invite the blessings of the five families of Dorje Shugden into your life with this exclusive set of 5 resin tsa tsas with antique bronze finish. The five forms of Dorje Shugden represent the different types of enlightened activities and bestow the benefits of healing, abundance, control, protection and wisdom. Dharma Protector Dorje Shugden is the wrathful emanation of the Buddha of Wisdom, Manjushri. Fierce yet compassionate, he manifests in five different forms, each representing a different type of enlightened activity (pacification, increase, control and wrath). 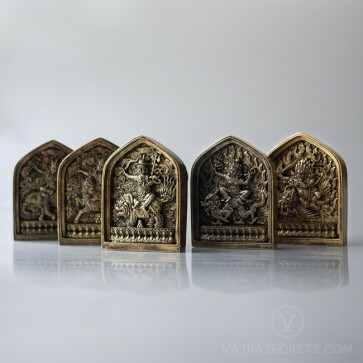 This exclusive set of 5 resin tsa tsas with antique bronze finish is an excellent meditational aid, perfect for smaller shrines at home or in the office, and bestows the benefits of healing, abundance, control, protection and wisdom. The principal emanation, also known as Duldzin Dorje Shugden, grants powerful protection from negative energies and black magic, swiftly helps overcome life’s obstacles, and attracts the positive energies of wealth, peace and wisdom. This "pacifying" form of Dorje Shugden is revered by many for his ability to purify one’s negative karma, pacify natural disasters and calamities, and is especially efficacious for overcoming illness and disease. This "increase" form of Dorje Shugden is revered by many for his ability to increase lifespan, material resources, merit, spiritual realisations, and all that is good. This "controlling" form of Dorje Shugden is revered by many for his ability to bring about peace of mind and help tame very negative minds, people and situations for virtuous reasons. This most wrathful and fiercest form of Dorje Shugden is revered by many for his ability to bestow protection from harm, spirits and black magic, and to overcome the most difficult obstacles and powerful delusions. *Product dimensions and weights apply to each individual tsa tsa. My daughter invited the 5 families home as a 3rd anniversary gift. They are beautiful and so detailed. These tsa tsas have really nice finish and their blessings are vast. May all beings have happiness and it's causes.